We’d love your help. Let us know what’s wrong with this preview of Finding the Gift by Angela Howell. 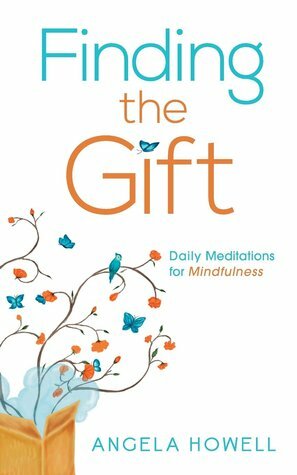 "Finding the Gift: Daily Meditations for Mindfulness" encourages readers to press pause for a few moments every day to gain life-changing insights from metaphors found in the most unlikely places. Whether it's from watching a favorite pet, a calm moment with nature, or a trip through the car wash, lessons to challenge and improve our well-being are everywhere, when we're m "Finding the Gift: Daily Meditations for Mindfulness" encourages readers to press pause for a few moments every day to gain life-changing insights from metaphors found in the most unlikely places. Whether it's from watching a favorite pet, a calm moment with nature, or a trip through the car wash, lessons to challenge and improve our well-being are everywhere, when we're mindfully watching for them. To ask other readers questions about Finding the Gift, please sign up. This little book is a refreshing approach to the daily meditation. The author offers insightful advice and guidance to her readers in a way that says she's been there before. I particularly enjoy the overall tone of the book and the author's voice. Each day is like a personal conversation with Angela Howell. She'll tell you she doesn't have all the answers, but her way of looking for the lessons in the mundane will open your eyes to a different way of thinking about the chaos of life and how to This little book is a refreshing approach to the daily meditation. The author offers insightful advice and guidance to her readers in a way that says she's been there before. I particularly enjoy the overall tone of the book and the author's voice. Each day is like a personal conversation with Angela Howell. She'll tell you she doesn't have all the answers, but her way of looking for the lessons in the mundane will open your eyes to a different way of thinking about the chaos of life and how to handle it. My favorite thing about this book is how you can apply your own belief system to "Finding the Gift." No matter what religion you are or aren't, there is something here for you. That is NOT an easy thing to accomplish and I applaud this author for her careful consideration. You can read through the book, day by day, or if you're like me and you're terrible at keeping up with such things, you can read by topic, searching the index for a subject you need in that moment. What a wonderful and gifted writer. I read my first day in Finding the Gift this morning and loved it. I will look forward to reading Angela Howell's inspirational and insightful reflections each day. Thank you Ms. Howell for sharing your introspection with us. Lovely. Well written, quite insightful, thought provoking and very enjoyable. This is one book that I will happily purchase the actual physical copy so I can write in the margins and show it to friends. I want to thank you again for choosing me as a winner of your book. It is actually amazing I received this message shortly after my grandmother messaged me thanking me for gifting the book to her. I chose to give her this book because my grandpa passed away in Christmas Eve and I felt this would be a nice inspiration to her. She has always put everyone else before herself. She knows the importance of understanding what others are going through to know she is not the only one who has suffering. She messaged me this morning to tell me how useful your book is for her. I will gain more insight from her as she continues reading and I will also let her know your comments about the entries you mentioned. I will eagerly await the day she finishes it so I can read it myself! Nice read. I took it slow and really tried to digest all of the mindful readings in the book. Lots of thoughts to ponder. Angela Howell has long been on the road to personal freedom. She survived a lengthy battle with anorexia and bulimia, and went on to earn multiple sales awards and top recognition with several Fortune 500 companies, until a work injury ended her career. Angela is the author of "Finding the Gift: Daily Meditations for Mindfulness," which reveals life lessons in the form of metaphors found in the mo Angela Howell has long been on the road to personal freedom. She survived a lengthy battle with anorexia and bulimia, and went on to earn multiple sales awards and top recognition with several Fortune 500 companies, until a work injury ended her career. Angela is the author of "Finding the Gift: Daily Meditations for Mindfulness," which reveals life lessons in the form of metaphors found in the most unlikely places. Passionate about wellness and success, Angela has been seen in Yahoo News, Cosmopolitan, Fast Company and is a regular contributor to Huffington Post. As a speaker, Angela shares her compelling story of triumph and success with a variety of audiences and uses her coaching program to help clients create "A Life Worth Having." Angela is married to her first husband, G. Patrick Howell, a former undercover agent. Patrick is also her third husband! Their marriage and love affair is quite a story all its own, and has been ongoing for over thirty years (including her crush on him as a youth worship leader, when she was just thirteen). Together, they have a twenty-year old son and for the moment, four cats!